The Smart Asia India Expo & Summit, which is the largest smart cities event in south India, was unveiled on Thursday at the Bangalore International Exhibition Centre (BIEC). 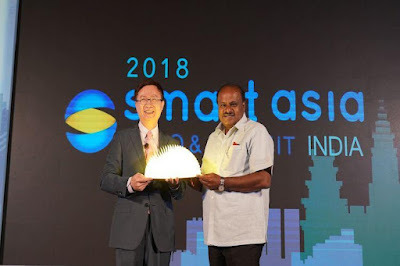 Organised by the Taipei World Trade Centre (TWTC), the Expo was inaugurated by the Chief Minister of Karnataka HD Kumaraswamy, alongside James CF Huang, Chairman of the Taipei World Trade Centre, Shekar Viswanathan, Chairman of FICCI Karnataka State Council and Anjum Parwez, UD Secretary of Karnataka. The Expo and Summit is positioned to offer more comprehensive solutions from the smart city domain. This year’s show features four exhibition areas and summit themes including: ‘Smart Transportation’, ‘Smart Energy & Water Management’, ‘Smart City Development & Environmental Sustainability’ and ‘IoT Solutions’. These themes are being brought to life by 50 outstanding exhibitors in 100 booths. Heavyweight visitors include Urban Development Department of Karnataka, Coir Board of the Indian government, TATA Group, Lodha Group, Mizuho Bank, Indian National Informatics Centre, Nashik Engineering Industrial Cluster, among others. This year’s key exhibitors include Advantech, which is among the world’s top three intelligent system suppliers, exhibiting smart EV charger, medical and retail equipment; and ACER ITS, the largest bus ticket system supplier in Taiwan with a market share of 70%, providing e-ticketing and parking solutions. Ever-Clear Environmental Engineering Corporation and Optol Technologies Pty. Ltd. will showcase their cutting-edge smart utilities solutions, including water treatment equipment and smart LED lighting. 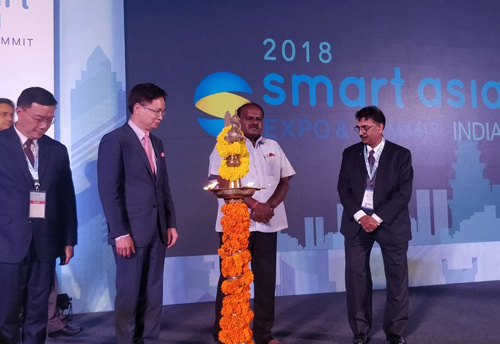 Other experienced companies specialising in smart cities development and IoT solutions, including Avision, MOXA, HPB, Edgecore Networks, to name a few, will also exhibit their state-of-the-art products and services, and contribute to India’s ‘Smart Cities Mission’. One of the major highlights of the event is the ‘India Taiwan Smart Cities Summit’. Organised by TWTC and co-organised by the Federation of Indian Chambers of Commerce & Industry (FICCI), the Summit will welcome panelists from both India and Taiwan, who will discuss new technologies and applications, as well as the latest trends for optimising India’s infrastructure. It will also include representatives from Asian Development Bank, TATA Group, Amazon and others. The opening day of the Summit, which will run till October 6, featured the ‘India-Taiwan EV Business Opportunities Forum’, where the Taiwanese EV company JS Power signed an MOU with its Indian partner, to set up a joint venture and cash in on the rising demand for lithium batteries.